Coming the day after the Scottish independence referendum, September 19, 2014, was a rather different election hangover from June 9, 2017. Three years ago, the young and forgotten used a lively campaign to lay their own claim to Scotland’s future, investing their hopes in the promise of a new democracy. The historically high turnout — only one in seven Scots abstained — reflected the urgency of the dreams riding on the referendum. Yet ultimately, a slim majority voted to keep the country in the United Kingdom. The vitality of 2014’s “Yes” movement, rising in a few months from below 30 percent in the polls to an eventual 45 percent, owed to a diverse array of local groups and autonomous voices. Among these, Women for Independence, Common Weal, and the Radical Independence Campaign were but the most prominent. Without their activism, it would have been an entirely different contest. Yet the very fact that the referendum took place owed above all to the Scottish National Party (SNP), and in particular its long-time leader, Alex Salmond. The Scottish independence movement did indeed continue after the referendum, and the SNP itself reached historic highs in the 2015 general election, winning fifty-six of fifty-nine seats, and a fresh mandate at the 2016 Scottish Parliament election. In March 2017, new SNP leader Nicola Sturgeon announced her intention to organize another independence vote. Yet Salmond’s defeat in his Gordon constituency in Thursday’s general election symbolized wider difficulties for Scotland’s biggest party. Political predictions are risky when the United Kingdom is so unstable; the question is whether the SNP can navigate a course through the crisis. Without doubt, Alex Salmond was — and is — divisive. He is also a hated figure, often caricatured in the press, particularly (but not only) in London. In the 2015 election, the Conservative campaign strongly foregrounded the idea that a Labour-led coalition under Ed Miliband would be held hostage by the Scottish Nationalists: one Tory poster showed Miliband in the SNP leader’s pocket. But this was also a backhanded compliment to Salmond’s strength as a leader, and indeed the other sense in which he is “divisive.” For Salmond’s greatest achievement was that he drew new dividing lines in Scottish politics. While in the 1950s, the Conservative-linked (but separate) Unionist Party represented a strong right in Scotland, and in subsequent decades a country representing under ten percent of the UK population had little impact on general election results, this changed beginning in the 1990s. As both a Westminster MP and Scottish leader, Salmond was instrumental in establishing unionism versus independence as a central basis of political identification in Scotland. This was also linked to the hollowing-out of Scottish Labour, which had held a large majority of seats during the Thatcher and Major governments of 1979 to 1997; today, it is only the third-largest party in Scotland, behind the Tories, the strongest anti-independence force. Indeed, the SNP has not always enjoyed a dominant position in Scotland. Before the creation of the Scottish Parliament in 1999, it had never secured more than eleven Westminster seats (one sixth of Scotland’s total). Labour minister George Robertson famously promised that Tony Blair’s creation of a devolved assembly in Edinburgh would “kill nationalism stone dead,” satisfying the demand for national autonomy. Yet this parliament in fact provided a platform from which the SNP could build itself as a party of Scottish government, even while in permanent opposition to UK administrations. This was the strategy advocated by Alex Salmond, an SNP MP since 1987, who became its leader in 1990 at just thirty-five years old. Although in the early days of the Thatcher government, he was a leading figure in the republican-socialist “79 Group” — and was thus briefly expelled from the SNP in 1982 — Salmond became head of a gradualist tendency, which unlike SNP “fundamentalists” advocated intermediate steps toward self-government within the UK. 2007 saw the surprise formation of an SNP minority government at Edinburgh’s previously Labour/Liberal Democrat-dominated Holyrood parliament, and Salmond’s party won a majority of seats 2011, despite a semi-proportional voting system designed to favor coalitions. The SNP’s advance also reshaped Scottish politics more broadly. With Salmond’s 2007 breakthrough, the “Scottish Executive” was renamed the more powerful-sounding “Scottish Government,” its First Minister now a national leader rather than a regional Labour officeholder. Other parties began to speak more forcefully of “Scotland’s interests” and to at least feign greater autonomy from their respective UK parties. Hapless Scottish Labour leader Jim Murphy even added the word “patriotic” to his party’s constitution, peppering his speeches with football metaphors to try to claim back some identitarian territory from the SNP. Far from historic Labour claims that the once rurally based and Protestant-centered SNP were mere “Tartan Tories,” Salmond repositioned the party as a broad church whose demand for the return of Scottish oil revenue (among various other investment policies) could also fund progressive social measures. While the Tory destruction of Scottish industry in the 1980s had galvanized a strong Labour vote, the 1990s saw the brief emergence of the Scottish Socialist Party (SSP), whose leader Tommy Sheridan played a key role in resistance to the Poll Tax. The mass non-payment campaign in Scotland (and in England after it was also introduced there) had helped force Thatcher from office, and this set the stage for a radical left presence in the Scottish Parliament from 1999 onward. The SSP’s self-destruction in the mid-2000s, however, allowed the SNP to hoover up working-class support and contain the opposition from other pro-independence forces. With Labour growing distant from its historic base, the SNP could portray itself as a bulwark against the running down of the welfare state. In office in Edinburgh starting in 2007, the SNP pointed to its flagship free education policy and measures to thwart the Tory “bedroom tax” (benefit cuts for those with supposedly “unoccupied” rooms) as evidence that Scotland could follow a different course. While Salmond’s SNP was always a pro-business party interested only in electoral politics, it projected a strong progressive image. Its sometimes-sharp opposition to Tony Blair’s foreign policy particularly focused this agenda. While during John Swinney’s brief stint as leader, the SNP backed the 2001 invasion of Afghanistan, Salmond criticised the NATO intervention in Yugoslavia as “an unpardonable folly” and became among the most dogged opponents of the 2003 invasion of Iraq, calling for Blair’s impeachment. The party also opposes the UK government’s Trident nuclear weapons program, located close to Glasgow. Having secured a Holyrood parliamentary majority in 2011, the SNP was finally able to legislate for a referendum on independence (David Cameron having conceded this prerogative), bringing Salmond’s gradualist strategy to fruition. Unlike the assortment of local councilors and old hands offered Scottish Labour jobs in Edinburgh (the supposed “talent” went to Westminster), the SNP created an effective leadership team in the Scottish capital. It had been able to rule effectively even as it opposed London governments’ austerity policy and the tightening of the budget it received from UK-wide taxation. With a Tory/Lib-Dem coalition in power in London, Salmond sought a mandate to pursue his government at the head of an independent Scottish state. Reflecting Salmond’s typical strategy, the SNP government’s independence White Paper in 2014 sought to speak to a wide array of constituencies. Strongly focused on defense of public services from endless right-wing rule from Westminister, much of the campaign was centered on winning Labour voters to the “Yes” cause. Yet the SNP also sought to present the independence vote in terms of continuity, shoring up its significant chunk of middle-class support even as it made raids into territory Labour had taken for granted. In this vein, Scotland would remain in NATO, but would get rid of nuclear weapons. It would keep the Queen, though there was some vague talk of a future institutional referendum. Rather more damagingly for Salmond’s economic credibility, Scotland would be free of London’s economic policy and yet continue to use the pound. Social Attitudes Surveys showed that Scottish voters’ policy views were similar to those of their English counterparts. The SNP, however, crafted an optimistic if rather nebulous vision of a progressive Scottishness, able to galvanize almost half the country. This also provided a platform for a movement to emerge that was far more radical than the SNP’s planned stage-managed campaign. Salmond’s party was strong at its center, with its defining cause of independence giving it a unity, purpose, and leadership quality unknown among Labour or the Conservatives. Yet the SNP was and is profoundly hierarchical. This monolithism helped win the parliamentary majority necessary for beginning the referendum process, and in this sense Salmond played a decisive role. However, 2014’s more broad-based referendum campaign brought hundreds of local meetings and initiatives that supported independence yet were outside or even critical of the SNP party machine. A notable distinction developed between being a “nationalist” — even in the SNP’s civic-minded and clearly anti-racist sense of the term — and being “for independence” as a democratic demand, able to act as a cipher for a range of hopes for change. 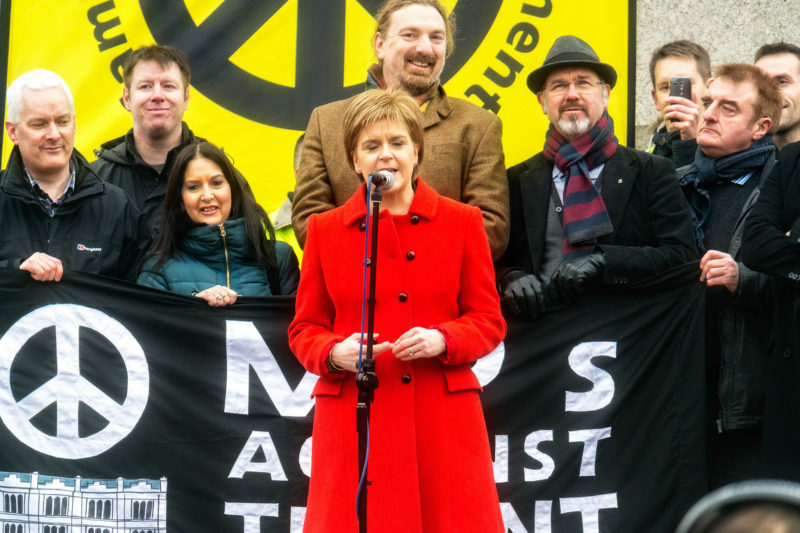 Nonetheless, after the referendum defeat, the SNP proved best able to capitalize on this broader mobilization, as young activists and even long-time Labour voters sought a new political home. The Labour-Tory alliance in the anti-independence “Better Together” campaign sharpened disgruntlement with the “extreme center” politics so widespread in Europe. In Scotland, the SNP was the main beneficiary, under new leader Nicola Sturgeon. More than her predecessor, she initially enjoyed very strong favorability ratings across party divides. While Salmond had enjoyed a long spell at the top of the party from 1990 to 2000 and from 2004 to 2014, the SNP now made bold advances with new leadership, and indeed new activists. The SNP surge following the September 18, 2014, vote saw the party top 120,000 members — more than one in fifty Scots. It won almost every Scottish seat at the May 2015 general election. Mhairi Black, entering parliament at age twenty, a sharp critic of Tory cuts and herself from a Labour family, particularly embodied the SNP’s rise. Even today, the SNP remains Scotland’s leading force. While at the 2005 and 2010 elections it held just six seats, it today holds thirty-five of fifty-nine Scottish constituencies, after winning 37% of the vote on Thursday. By comparison, the Tories now hold thirteen seats and Labour seven in Scotland. Yet this is a decline from the SNP’s 50% score in 2015 (fifty-six seats) and the 46.5% constituency vote it secured in the May 2016 Scottish Parliament election. Angus Robertson, a powerful critic of Theresa May in the House of Commons, like Salmond lost his seat. While in March 2017, Sturgeon announced plans to call a fresh referendum on independence, this seems an increasingly remote prospect. Purely episodic factors do much to explain the SNP’s difficulties. While Sturgeon has been First Minister for less than three years, the party has been in government in Edinburgh since 2007. This is a long time for any administration to maintain support; by the end of this parliament, the SNP will have been in office longer than either Thatcher or New Labour. The collapse in oil prices since 2014 has also damaged the economic basis for independence, particularly insofar as opposition parties endlessly repeat that this alone is the basis of the SNP’s economic plan. The carryover of the referendum campaign into the 2015 general election, where the party strongly asserted the possibility of a team of SNPers holding a putative Labour UK government to account, has died away. Scotland’s other mainstream parties are also recovering, in particular the Scots Tories, posing as the main party of the Union. They have found an effective leader in Ruth Davidson, who robustly (if hypocritically) attacks the SNP’s faltering progress on education and health. Beyond the fact that she herself is gay, Davidson has also sought to position the party in somewhat more liberal tones, favoring a less harsh Brexit than May (possibly including staying in the single market). This is of particular interest given that the thirteen MPs she leads outnumber the ten MPs of Northern Ireland’s hard-right, homophobic, and loyalist Democratic Unionist Party (DUP), whose support May is currently trying to secure. Reduced from forty-one seats to just one in the 2015 general election, the Scottish Labour Party has remained a bastion of anti-Corbynism and seems to have learned little from its recent collapse. Party right-wingers like Scottish leader Kezia Dugdale and “No” campaign coordinator Blair McDougall each called on Scots to vote tactically, Labour and Tory together, to block the SNP. Yet despite this head-in-the-sand mentality, the increased number of socialist candidates for Labour on June 8, coupled with Corbyn’s rise in the UK generally, offer at least a partial change of tone. These developments are gaining particular traction given the wider strategic problem for the SNP, namely the meaning of Brexit for Scottish independence. If, in a sense, the UK looks more divided than ever, the looming disruption does not itself help the SNP cause. While Sturgeon is often accused of using the European question as a mere pretext for a fresh independence vote, in reality Brexit has forced her to begin calls for IndyRef2 far sooner than she would otherwise have wanted, not least given the lack of movement toward “Yes” in the opinion polls. It also causes major problems for the prospectus outlined by Salmond before the 2014 referendum. Beyond the SNP’s anti-racist and relatively pro-migrant stance, opposed to Tory/UKIP racism, its pro-EU position offers no easy path to independence. In March 2017, Sturgeon appeared to have boldly seized the political initiative, announcing plans for a second independence referendum. Yet this was also a reaction to being backed into a corner. With Theresa May abandoning her promise to consult the devolved administrations before triggering Article 50 to leave the European Union, any hope of special status for Scotland or it staying in the European free trade area was lost. Knowing that the post-Brexit economic disruption could cause unfavorable conditions for a supposed “leap into the unknown,” Sturgeon would prefer to hold a vote before the UK’s departure from the EU is finalized. Yet May has refused to allow any such referendum to go ahead, unlike David Cameron in the 2012 Edinburgh Agreement. While in June 2016, Scots went against the UK-wide trend by voting 62 to 38% to stay in the EU — with an only slightly higher Remain vote among SNP voters, despite the party’s strong pro-European position — Brexit provides a rather contradictory basis for independence. Sturgeon has argued that a referendum toward the end of the leaving process would allow a choice between Scotland in the EU or in a hard-Brexit UK. Even beyond the question of whether Scotland would remain in the EU uninterruptedly even if it did break from the UK, there has thus far been little apparent shift in opinion on independence as a result of the Brexit referendum. This reflects both a climate of uncertainty and problems with the EU itself. During the 2014 referendum, the Eurozone crisis made it unthinkable for Salmond to advocate joining the euro. He instead favored keeping the pound, even if not being able to issue currency, or to rely on the Bank of England as a lender of last resort. This attachment to the rest of the UK is further entrenched by the Brexit vote, and in particular the London government’s plan to leave the customs union, possibly even meaning tariffs with EU countries. This would make it difficult for Scotland to choose the EU over UK-wide “free trade,” not least given that Scotland’s exports to the rest of the UK are four-to-one greater than to the rest of Europe. To this consideration we can also add the EUs well-known budget straitjacket, undemocratic reputation, and likely future of closer fiscal integration. It remains unclear whether there will be another Scottish independence vote in the near future. Once again, the UK election result little reflects how Scotland voted, despite the Tory advances there. Theresa May will certainly not want to allow a referendum, particularly following her evident miscalculation in calling a general election, and Nicola Sturgeon herself seemed to pitch the idea further into the future during the campaign. Unsurprisingly, most newspapers and the other parties have already leaped on the SNP’s declining support as a rejection of her plans. And it is clear that tactical voting by unionists, or even the Corbyn surge, cannot alone explain the SNP’s fall from 50% to 37% of the vote. The momentum of the independence campaign and the hopes it carried forth are beginning to move away from the SNP, though it remains to be seen whether they will be mobilized in other forms. Clearly, the vast bulk of those enthused by the 2014 referendum campaign preferred the SNP as a new political home to either RISE — the new coalition formed by a number of socialists that had also been active in the Radical Independence Campaign — or the Greens. There is a continuing movement for independence in which the SNP is the lead actor, and the UK certainly looks far from strong and stable. But with middle-class voters flaking away to the Conservatives, the SNP no longer enjoys the all-conquering aura of recent years. Scottish Labour, having again come third behind the Tories, is not necessarily well placed to take advantage. Corbyn himself has been quiet on Scotland or constitutional questions, and has allowed Edinburgh-based leaders to continue with their own policy. Yet the hope of a left-wing Labour government at the UK level, made rather more real on June 8, offers at least the possibility of a recovery. The SNP’s long-term rule in Edinburgh, combined with the fact that bad memories of Labour’s own 2000s record are ever-more distant, could further fuel this tendency. In the run-up to the 2015 election, Labour leader Ed Miliband was consistently pressed on the question of whether Labour would reach a UK-wide deal with the SNP. Even if not a formal coalition, which he expressly ruled out, there lingered the suggestion that if he fell only a few seats short of a majority, he could reach some sort of arrangement with Sturgeon’s party, not entirely unlike Theresa May’s likely confidence and supply arrangement with Northern Ireland’s hard-right DUP. Despite references to a “Coalition of Chaos,” the 2017 media smear campaign against Corbyn was more sharply focused on the Labour leader’s own alleged “un-British” sympathies than his relations with the SNP particularly. The dogged rivalry between the SNP and Scottish Labour, and the latter’s recent unionist alliance with the Tories, makes accommodation between the two parties essentially impossible, except insofar as they will both be in opposition in Westminster. The very first attacks on Corbyn’s leadership in fall of 2015 were focused on constitutional and “patriotic” questions — his republicanism, his support for a united Ireland, his “refusal” to sing the national anthem, his opposition to nuclear weapons — and he has backed away from “controversial” stances on these issues. In March, he was quoted as remarking that he could accept a second Scottish referendum; Labour, however, may be drawn away from such a position, due to both pressure from its Edinburgh leaders and the prospect of recovery in Scotland. Emboldened within party ranks by the general election and the successful campaign, Corbyn now has greater authority to set the political agenda, not unlike Alex Salmond did in 2000s Scotland. Not just defined by its opposition to the Tories or the difficulties of uniting a party base so divided by Brexit, Labour has already begun talking about a different way of doing politics. Notably, this has also meant the mobilization — just like in the 2014 Scottish referendum — of youth and previously non-voting groups, a strategy long dismissed as implausible by media and polling experts. Despite the giddy heights of the referendum campaign and 2015 general election, on Thursday, SNP was less able to achieve this same feat. Its one million votes were a fall from one and a half million two years ago. Without doubt, it has gained support in Labour’s historic heartlands, in last month’s local elections even breaking its hold on Glasgow council. And clearly Scots did not vote for a Tory-DUP coalition. Yet with the UK heading out of the European Union and the meaning of Scottish independence unclear, it is difficult for Sturgeon to provide a sharply defined vision of what comes next for Scotland. The fate of the now-weakened Tory government in Brexit talks will be decisive for the SNP’s chances of recovery.